Down in the sewer lair, Leonardo, Michelangelo and Donatello are busy childishly arguing over chores and what-not. April comes storming out of the kitchen and scolds them, asking the teenagers to start acting like adults. Raphael, meanwhile, has his nose in a book, trying to figure out what it means to be an “adult”. Knowing that he won’t learn in anything in the lair, he decides to go to the surface and watch some adults in action. Prowling the streets, he witnesses adults engaged in prattling, inane conversation and wonders if he even wants to become an adult. But just as Raph starts to think all adults are boring, he spots one with a giant flaming carrot for a head. Intrigued, Raph stalks the weird-o (the Flaming Carrot, naturally), who breaks up a fistfight and pulls a weed out of a windowsill (then puts it back when he remembers that plants create vital oxygen). The Flaming Carrot’s “sense eyes” detect Raph’s presence and the Carrot leads Raph on a chase, eventually turning the tables and stalking the confused Turtle. Trying to find the Carrot, Raph instead finds a suspicious-looking man sitting on a rooftop. The man’s hand falls off (and he quickly reattaches it) and Raph, intrigued, infiltrates the man’s apartment. Inside, he finds it to be nothing but empty space filled with boxes of junk. The man comes inside and Raph hides behind some crates. The man finds a sai that Raph dropped and extends his eyes out of his sockets to inspect the weapon. Suddenly, another man looking identical to him knocks at the door. The pair greet each other, speaking strange gibberish and proceed to get drunk on cans of Sprite. As they play a record of old folk songs, they begin dancing with blow up dolls… seriously creeping Raph out. A paper airplane then draws the pair's attention and Raph looks to see who threw it. The Flaming Carrot stands at the window and quietly motions for Raph to sneak away to safety. The weird-os notice Raph, however, and zap him with a raygun. Before he can come to, they set him under a device called a “memory vortex” that gives Raph amnesia. The two men leave and the Carrot sneaks inside to help Raph. Unfortunately, he gets bored and falls asleep. When he wakes up, though, he wheels Raph out in a wheelbarrow and takes him to Mysterymen Secret Hideout #28. Flaming Carrot tells Raph that he’s a member of the Mysterymen, a group of B-grade superheroes not good enough for the Avengers or the Justice League. They’ve left Iron City and come to New York in order to track down the Vile Brotherhood. Raph, meanwhile, has no memory of who he is. Carrot asks him if he’d like to become a superhero and Raph readily accepts the offer. Carrot fashions him a costume out of a bread sack and gives him some plungers for weapons and a utility belt made from old Band-Aid tins. Thus, Raph becomes the Dark Avenger. The Carrot and the Dark Avenger then go looking for crimes to thwart and stumble across a pair of hooligans fishing for alligators in the sewer… with kittens as the bait. They beat the thugs up and rescue the kittens. The Carrot leaves his calling card (stuffing the orifices of the unconscious thugs with carrots) and the two superheroes leave to return the kitties to their owners. *The story continues in Flaming Carrot Comics (Vol. 1) #26. *The “Bob Speaks” editorial in this issue describes this as a two-issue story arc. It is, in fact, a three-issue arc. 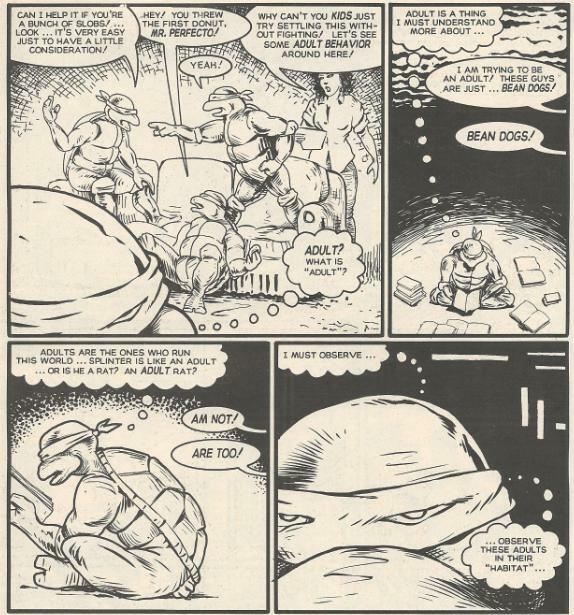 *According to the “Bob Speaks” editorial, Burden had originally only envisioned a single TMNT/Flaming Carrot crossover, but after numerous rewrites, decided to split the story into two; one published by Dark Horse and a second published by Mirage. 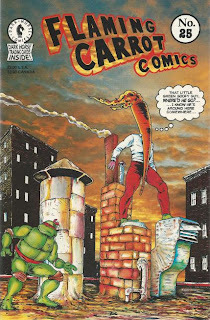 *This issue also contained a “What is this Flaming Carrot” comic strip by Burden, two free Dark Horse Comics trading cards, and a back cover pin-up of the discarded cover for Flaming Carrot Comics (Vol. 1) #2, also by Burden. The Flaming Carrot. 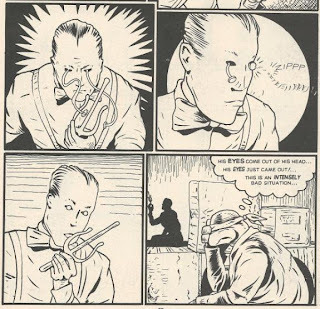 Now there’s an indie comic from back in the day I could never quite get into. 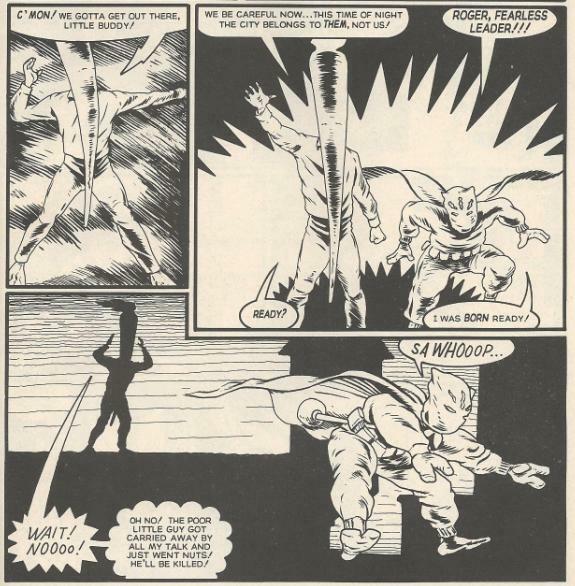 When it came to outrageous superhero parody comics, I was more a fan of "The Tick" (or, more specifically, the awesome cartoon series) and Flaming Carrot never really drew me in. I enjoyed the movie, “Mystery Men”, well-enough… albeit, it somehow managed to be a Flaming Carrot movie that didn’t include Flaming Carrot (according to the Q&A on the DVD, they omitted the star of the comic because execs thought he’d look “too bizarre” on screen). I just don’t have any attachment to the Flaming Carrot and I can’t manufacture one no matter how hard I try. 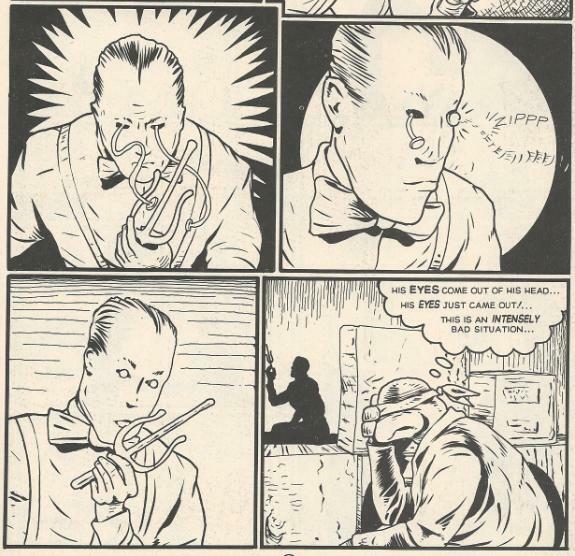 Reading the old comics for the first time, they tend to not be very… well, funny. Burden relies too heavily on “lol so random” attempts at humor which are about as clever as a game of Mad Libs. I think that’s one of the reasons why I always preferred the Tick, as it was full of silliness and absurdity, but never used randomness as a substitute for actual jokes. Storywise, I felt Mikey would have been better suited for this sort of plot, as he’s the comic book nut, not Raph. Raphael wandering off alone to ponder the meaning of adulthood felt a little strangely introspective for the character, and again, might have been a better fit for Mikey (as in, say, the other Turtles chide him for being immature so that causes him to go looking for the definition of maturity, etc). Burden’s art is better than his writing and I love his panel layouts. The style is very classy and reminiscent of old Golden Age comics. I can’t think of much else to say about this first chapter in the arc. I’m sorry if I’ve disappointed any of you Flaming Carrot fans out there, it’s just that the book isn’t really my thing. You're imposing your own, unrelated expectations on Flaming Carrot and acting like the book is falling short when it doesn't meet them. In my view, Flaming Carrot is not supposed to be full of traditionally structured gags like The Tick, so there's no point in comparing them. It's clearly not supposed to be a traditional comedy at all, so saying it's not "funny" doesn't hold much water. To me, Flaming Carrot is supposed to be an unrestrained work of pure imagination, strange and downright scary at times. Something you seem not to be equipped to appreciate. Hey, to each his own. "LOL so random" just isn't my thing. You can crucify me all you want over that. Colin does have point about how Flamming Carrot wasn't meant to be like The Tick. And how it's humor is meant to be more random and surreal. But at the same time Mark does has right to his opinion. The only reason I can see it being Raphael and not Michelangelo is because of the fact that in issue 15 of the original Mirage run he was established as a fan of Flaming Carrot, so it would be natural to put him in the position to hang out with his hero. Though the implications of the Flaming Carror being both a real person and a comic book idol in their world begins to blow my mind. Simply because the convergence of the insane randomness of his world and the turtles world is hard to comprehend and leaves my brain tired. It sounds like you didn't quite pick up on what I was trying to say. Maybe I didn't express myself clearly, but I think I can do better. The problem with your response is that nowhere in Flaming Carrot is there an attempt to give "LOL"s or to be "so random". Flaming Carrot is primarily a surrealist piece. Do you enjoy or are at least familiar with Dali? His work isn't "so random". A good surrealist makes his work feel like it could be a dream you had. One of my favorite Flaming Carrot stories is about a dead dog flying circles around the city. Only Flaming Carrot is able to stop it- by putting a jellybean in its eye socket. Certainly not supposed to illicit LOLs. But not "so random" either- it makes some strange sense, akin to dream logic. So if you're going to dismiss Flaming Carrot, do it based on qualities it actually possesses. Because when you dismiss it based on qualities it does not possess it makes you sound dismissive, or worse. I appreciate you replying to clarify your statement. By the time I finished the TMNT crossover arc, I felt a somewhat better understanding of Burden's style. What you're saying, though, is that Flaming Carrot is not a comedy and isn't intended to be taken as a piece of humor. From that perspective, I can see why I didn't find it "funny". Nevertheless, it appeared to me as less an exertion of genuine surrealism (as the Dali analog of yours suggests) and more an attempt at "screwball" entertainment, which is generally considered a form of comedy. Whatever the case, putting aside my preconception that Flaming Carrot was supposed to be funny (perhaps instigated by the fact that the movie based on the comic was, in fact, a comedy), I took other issues with Burden's style of writing which I detailed in my reviews for #26 and #27. I also found aspects I enjoyed, yes, and listed them for the sake of being fair. Regardless, I don't think Burden's style of writing is really for me, as the stream of consciousness pace, moving from one bit of nonsense to the next, made for tedious reading. But everyone is entitled to their own tastes and I'm sure there are books I love that others loathe. I really appreciate you hearing me out Mark, and I think we have a much clearer view of each other's perspectives now. Thanks!